My sister Judy emailed the other day and remarked that it was about a year ago that I’d rung her in Adelaide and said, “I’m not feeling so good.” It takes a lot for me to ring my sister and say something like that – a year ago this month I was in actuality dying and just not realising it. I was in the midst of test after test after test, I couldn’t keep a thing down (the most I could eat in a 24 hour period was half a cheese sandwich and a few spoonfuls of canned peaches … and not all of that all at once), I was exhausted and yet I couldn’t sleep, and I was nearing total despair (do you have any idea what it is like of not getting any sleep for 6 weeks plus on end? I remember begging the doctor to give me something that could make me sleep, and when I finally got some tablets it was total heaven. I still only managed about 3 hours a night, but that much was wonderful). I had to cancel the mail and the newspaper because I simply didn’t have the strength to walk 20 paces down the front path to collect them. I was in so much discomfort. My life had ground to a close. I think my sister came close to panicking as I explained all this to her – bit by bit, and it was all I could do to stop her flying out immediately. This is all so hard to recall. It was such a terrible, terrible time. I had no idea what was wrong and neither did the doctors. *shudder* I can’t talk any more about it. More than anything I dread sliding down into that state again. Not so much done in the garden today. I think I had done too much yesterday (not only had I done all that heavy gardening, but somehow, somewhere, I’d managed to walk 12 kilometers (about 7.5 miles) as well! I tried to go for a long walk this morning and felt very light-headed, so I came home and ate (love having an excuse to eat! After not being able to eat for months it is amazing to eat now). But I have done some. I have weeded half the onion patch (I think half my life is spent weeding the onions) and have fertilized them with fish emulsion. Also fertilized the peach trees, the potatoes, leeks, garlic, and the peonies. I rehung one of the solar garden lights that had blown off in winter gales (these are lovely, great globes of warm honey right through the night). I cut off two branches off robinia trees that I had somehow missed during winter pruning. I fed the manferns their spring pick-me-up of brown sugar and watered it in. 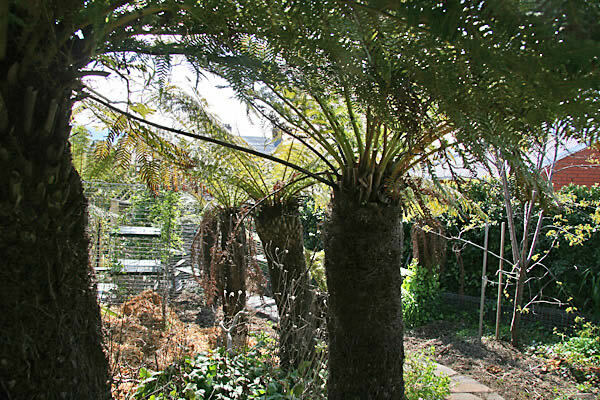 Here’s a fairly bad photo of some of the manferns. They stand about seven feet tall, and they’re still carrying their leaves from last summer (usually they will die off over winter – this is the first winter they’ve survived through). In about 2 months they will be crowned with huge branches of new leaves. I also pruned back the massive climbing rose that covers the sky between my house and the potting sheds – I need to clear out head room about 3 times a year. And I made a start on the woodland paths. The woodland has been sadly neglected for over 18 months and in this time the mulch and dirt and debris has spread right over the paths, so have made a decent start of clearing them off. Later: And planted about 30 pots of Blue Mini Popcorn for transplant later into garden, popped into greenhouse which is now getting a little crowded. Previous post More Copper, Fairies and a Job Finally Done. You’re such an inspiration Sara. I’m still so impressed that coming from where you were 12 months ago, you managed a 12km walk today. Hugs Sara. I didn’t do that 12 km all at once. LOL In stages through the day, perhaps 5 km in one hit at one point. I keep looking at the picture and am so surprised that those are ferns and not “palms” as I thought! That’s my total ignorance about manferns. Even if done in stages, 12km is quite a distance. That and all the gardening you have done is quite impressive. I’m sure that the warmer weather is very inviting and working in the garden must be a true delight. It’s the first day of Autumn here – I did some work in the garden on Saturday but it was very windy and the wind was cold, not very enjoyable. Please dont take any offence to what im writing your one of my All time favrite writer in the world but you seem to have change after you won your fight with cancer and your giving up on your site that tells about your books i havnt seen a new book about since the secound book for Serpent Bride came out your now always talking about flowers please help me understand why you would want to come the one site you made that is just about your writing your books i hope you not giving up on writing a fan. I had to chuckle madly over that one. Just about everyone who has gone through this kind of battle does this to some extent. You certainly start to live your life for yourself, and not for everyone else. There is going to be a gigantic shift in my writing over the next couple of years. When I am ready, I will tell people about it. While I’m an avid fan of your fantasy writing, it’s just as enjoyable to read about your exploits in the garden. You have a nice way of talking about gardening that doesn’t confuse the not-so-garden-savy and you’ve even inspired me to plant a few pots of my own (heirloom carrots, beans and poppies!). Thanks! Sara, I also love your books, but I also feel so lucky to get to know The Person Behind The Pen. Making changes in your life to recover from illness, or simply deal with it, is vital in the truest sense of the word. If the core of our vitality is broken, we must try to fix it. Like that great (and darkly hilarious) phone message shows, sometimes we need to snip off the unnecessary leaves in order for the plant to thrive. I happily tell the world that I turned 46 on Sept 5. I’ve been dealing with serious illness for 16 years…it started exactly 14 months after I got married…and while what I deal with isn’t currently life-threatening, it was certainly life-altering from Day 1. The ONLY thing that hasn’t changed is my husband. I can’t praise him enough. But everything else, from my career in New York (I worked for Rupert Murdoch!) to every other aspect of my personal life, has changed or ended. When faced with the choice of “change or die”, I chose to change. It wasn’t easy & it didn’t happen overnight, but it happened, and I often found inspiration in unexpected places. Not everyone around me was receptive to it, because it meant that they, too, had to change. Those people are no longer part of my life. I still meet my responsibilities and I am always open to new suggestions, ideas and experiences, but I have learned to use the magic word: no. Kudos to you, Sara, for taking control of your own ship!! Now..damn the torpedoes! Full speed ahead! Sara, I must admit to never having read any of your books or even knowing who you are until stumbling upon your site. All I can say is bravo – what a wonder you have created. This miami girl has looked at the mango trees and vast swathes of grass with new eyes- the iguanas won’t know what to do anymore….